dots Software, a subsidiary of Konica Minolta Business Solutions Europe, has integrated the pdfToolbox technology from callas software, a leading company for automatic PDF processing and archiving solutions, into its AccurioPro Flux printworkflow solution. The new version is now available to print providers and in-house print shops in public administrations, universities and companies who benefit from the OEM integration in the generation of the previews as well as the conversion of PostScript files to and from PDF. The print workflow solution is offered in three variations – depending on whether customers want to automate their prepress, edit print jobs within a team or set up an online print shop. The basic product AccurioPro Flux Essential is the toolbox for an efficient prepress. It focuses on the automation of typical processes and the central control of all production machines and ensures an increase of productivity. AccurioPro Flux Premium includes, in addition to the prepress tools, a central server that enables the collaboration of multiple print operators in the team as well as a wide range of evaluation and control functions. The most comprehensive product, AccurioPro Flux Ultimate, also includes an webshop optimized for business customers, which enables the convenient online ordering of print products. If the customer imports PostScript files, they are converted to PDF format using pdfToolbox technology. When it is necessary to use PostScript files instead of PDF files in order to make use of certain printer features, AccurioPro Flux converts PDF files to PostScript format thanks to callas technology. 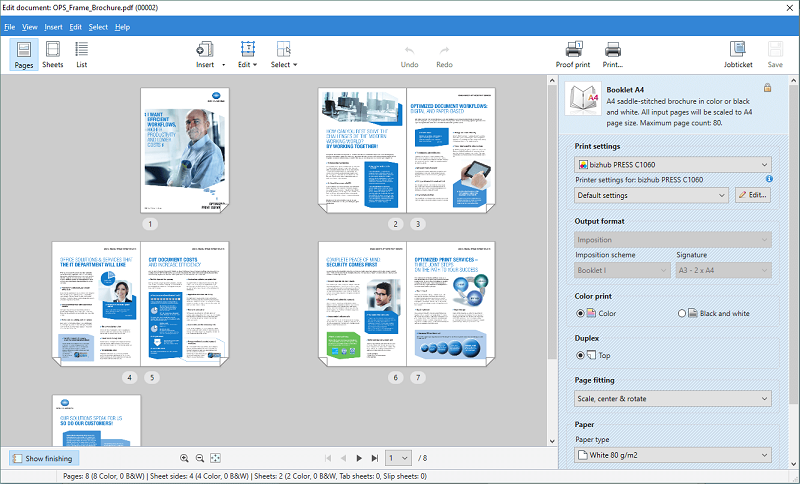 Print previews are also generated using the pdfToolbox technology. Customers benefit from significantly improved output quality. This is especially true for print documents that contain PDF transparencies. Previews are generated faster, which saves time especially with very large files. The preview is now closer to the actual output, allowing the customer to detect any errors easier in advance. In future versions of AccurioPro Flux, the integration of callas technology will optimize the preflight and automatically correct problems. In addition, dots software plans to use the pdfToolbox technology in AccurioPro Compile. This is a software solution for the simple organization of complex printing projects. In this product callas technology is also to be used for the generation of the previews and the PostScript generation. callas software finds simple ways to handle complex PDF challenges. As a technology innovator, callas software develops and markets PDF technology for publishing, print production, document exchange and document archiving. callas software helps agencies, publishing companies and printers to meet the challenges they face by providing software to preflight, correct and repurpose PDF files for print production and electronic publishing. Businesses and government agencies all over the world rely on callas software’s future-proof, fully PDF/A compliant archiving products. In addition, callas software technology is available as a programming library (SDK) for developers with a need for PDF optimization, validation and correction. Software vendors such as Adobe®, Quark®, Xerox® and many others have recognised the quality and flexibility provided by these callas tools and have incorporated them into their solutions. callas software actively supports international standards and has been participating in ISO, CIP4, the European Color Initiative, the PDF/A Competence Center and the Ghent PDF Workgroup. In addition, callas software is a founding member of the PDF Association and active in its board since then. callas software is based in Berlin, Germany. For more information, visit the callas software website at www.callassoftware.com. dots Software develops software solutions for digital production printing. Founded in 1997 in Berlin Kreuzberg, dots Software has been part of Konica Minolta Business Solutions Europe since 2005. Exclusively for Konica Minolta, dots Software is developing versatile print workflow solutions: AccurioPro Flux optimizes and automates the prepress process and enables the efficient management of print jobs. It simplifies the work in the team and allows the fast and uncomplicated online ordering of printed products. In addition, dots software has solutions for label printing as well as for the efficient organization of complex printing projects in the portfolio. With innovative software solutions, dots software not only simplifies and optimizes the work of print service providers, but also of in-house print shops in public administrations, universities and companies. AccurioPro Flux is available throughout Europe but also in many countries outside Europe, for example in the USA and Australia.